Background: A recent report noted a fourfold risk of ocular melanoma associated with employment in occupations involving use of cellular telephones. 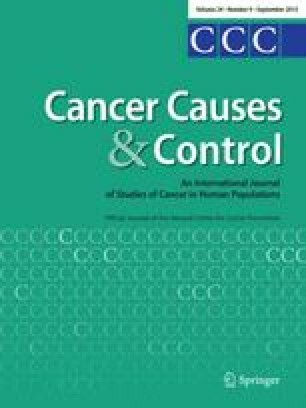 Methods: To aid interpretation of this finding, and clarify how subsite-specific temporal variation in incidence of ocular melanoma compares with that for cutaneous melanoma, we examined time trends in the incidence of melanoma among whites in the United States, based on data collected through the surveillance, Epidemiology, and End Results (SEER) program for 1974–1998. Results: The incidence of ocular melanoma decreased over time in both sexes, with no indication of a recent increase during the 1990s. The annual percent change was −0.7% for males (95% confidence interval: −2.3, 0.9) and −1.2% for females (95% confidence interval: −2.5, 0.0). Time trends appeared to differ by subsite of ocular melanoma; rates were flat for the choroid, decreased for the ciliary body, and increased for the conjunctiva (among males only) beginning in the 1980s. In contrast, all subsites of cutaneous melanoma, including the face and adjacent areas, showed marked increases in incidence over the observation period. Conclusions: The dramatic increase in use of cellular telephones has not been accompanied by an increase in the incidence of ocular melanoma. Further study is required to explain the different time trends for subsites of ocular melanoma, and for ocular versus facial and other cutaneous melanomas.